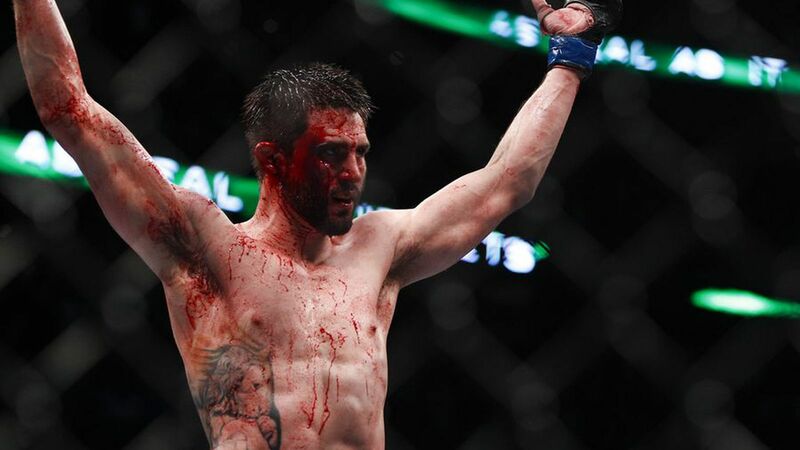 Are you frustrated Condit is not champ already ? Discussion in 'UFC Discussion' started by Hazuki Ryo, Aug 1, 2016. He just demolished Thiago Alves, gave Stun Gun his first loss with a nasty jumping knee, mauled Rory on the ground, punished Kampfmann, put Dan Hardy to sleep... Even though he didn't get the win against Robbie, it would not have been a scandal if he had been declared new champion. I believe he is a threat to anyone, and i'd like him to have his revenge against Woodley if he passes Maia. Condit 2017 champion ? If I was his fan I would be yeah. He was robbed against Lawler. Would have beaten prime Hendricks over 5 rounds. He should have held the true WW title at least once by now. Honestly one of the unluckiest cases ever. WouldNotBang, J. Bernie Cunningham, danny23 and 3 others like this. I'm not frustrated about it, but I'd definitely love to see it. He's pretty much everything I want in a fighter. I was never a fan, so frankly I don't give a damn if he ever becomes champion. He will never be a legitimate UFC champion. For as much as I like him, Condit strikes me as the type who would retire immediately after winning the belt. Not since he became the natural born runner. I used to be a condit fan. He got dominated by Hendricks and GSP. It's not their fault he can't defend a takedown. And got finished by Woodley and couldn't put Lawler away. He had his chance, he blew it. Mamou, Egnuldt and Redhawks100 like this. WouldNotBang, J. Bernie Cunningham, Lamfadha and 1 other person like this. Yes. Simple answer, short and sweet, yes. Hes had a lot of chances and failed. He might still make it but I doubt he will hold the title. I'm sure I'll take heat for opinion but I haven't been a fan since he chose to point fight against that guy from Stockton. When he is aggressive though I think he's a legit threat to anyone in the top 3 at WW. I'm pretty bummed about the loss to Lawler. Agree. Was a huge fan of his, then hearing both him and Greg Jackson try to talk about "how hard" Condit was kicking, etc. during that fight irritated me even more. Yes, Carlos throws all these ineffective kicks to stay far away and attempt to impress the judges, meanwhile Robbie was landing hard shots the whole fight, he did not want to engage with Robbie, and the judges seen that and made the right call.